New Delhi: The Central Bureau of Investigation (CBI) registered a Rs1,394.43 crore bank fraud case against Hyderabad-based Totem Infrastructure Ltd on a complaint by state-run Union Bank of India. “The CBI registered a case today (Thursday) on a complaint by Union Bank of India against Totem Infrastructure and its promoters and directors Tottempudi Salalith and his wife Tottempudi Kavita of Hyderabad," a person familiar with the developments said. 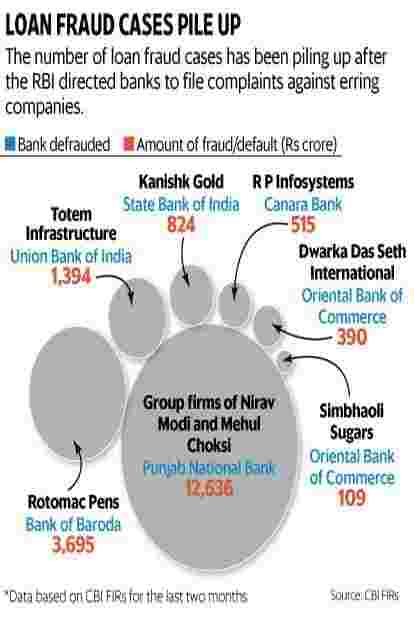 The number of bank fraud cases has been piling up after the Reserve Bank of India (RBI) directed banks to file complaints against erring companies. The latest case comes just a day after the investigating agency filed a case of loan fraud against Kanishk Gold Pvt. Ltd on a complaint by State Bank of India (SBI). Union Bank of India’s industrial finance branch of Hyderabad filed the complaint against Totem for cheating the bank to an extent of Rs313.84 crore. “Totem Infrastructure took a loan from a consortium of eight banks, including Union Bank, wherein the total outstanding dues stand at Rs1,394.43 crore. This account became NPA (non-performing asset) on 30 June 2012," the person added. The agency said that Union Bank of India had only recently filed a complaint with the agency against Totem Infrastructure. It was alleged in the complaint by Union Bank that “the company had diverted funds by opening accounts outside the consortium and through payments of wages by showing excess expenditure and inflated stocks. The entire sale proceeds were not allegedly routed through the dealing branches of consortium banks." Union Bank of India declined to comment on the matter. CBI said that it had tracked the promoters down and “have located the accused at a new place of residence and searches are underway". Other persons familiar with the case also confirmed that Totem Infrastructure was engaged in infrastructure projects, wherein “they took subcontracts from Larsen and Toubro Ltd, Ircon International Ltd and similar companies." In a statement, CBI added that “the said private company (Totem) based at Banjara Hills, Hyderabad, was in the business of EPC (engineering procurement and construction) contractor engaged in road projects, water works, building structures and also undertook works as a sub contractor to various companies." Totem Infrastructure did not respond to Mint’s calls or messages. On Wednesday, CBI registered a case against Chennai-based Kanishk Gold and its promoters Bhoopesh and Neeta Jain for allegedly defrauding State Bank of India (SBI) and 13 other banks to the tune of Rs824.15 crore, while also issuing lookout circulars against the accused. “The CBI, on Thursday, conducted two fresh searches (locations not disclosed) and questioned Bhoopesh Jain and Neeta Jain in connection with the case and lookout circulars have been issued against those who have been accused," the person cited above added. Lookout circulars are issued by the CBI against the accused in a case, so that they cannot flee the country. Other than Bhoopesh and Neeta Jain, the CBI also booked Tejraj Achha, a partner at Achha Associates; Ajay Kumar Jain, a partner in Ajay and Co.; Sumit Kedia who is a partner at Lunawath and Associates. While emails and calls to SBI remained unanswered, Kanishk Gold did not respond to calls either. Both the scams have come in the wake of the Rs12,636 crore PNB fraud case, where the CBI and the Enforcement Directorate have filed cases under the Prevention of Corruption Act and the Prevention of Money Laundering Act, respectively. However, both Nirav Modi and Mehul Choksi have declined to join the investigation. Yunus Lasania in Hyderabad and Gopika Gopakumar in Mumbai contributed to this story.